There comes a time in everyone’s life—a milestone birthday, a bachelor/bachelorette party or a special occasion that deserves celebrating—where your average food and drink venue just won’t cut it. You start to dream up ideas and conclude that it’s about the experience for you. You want to bring the most important people in your life together in a way that hasn’t already been done. You want to excite them and create the most insta-worthy party photos possible—maybe even photos you’ll want to print and frame. A Caribbean trip? Too expensive and a little excessive. Ice skating? Some skill required. And not everyone wants to wear beat-up rentals. Skydiving? Weather-dependent. Adrenaline junkies only. Pool party? Depends on the time of year. Also, there’s a 99% chance someone will pee in it. Arial silks? Acro yoga? Both fun to watch, but require some level of fitness your Uncle Bob doesn’t have. Also, sweaty. Comedy Club? Not everyone appreciates good humor. Settling on an activity that’s fun, engaging and something anyone with hands can do, is quite a challenge. Throw in an all-ages requirement and it gets even harder. Enter: axe throwing, the most inclusive sport sweeping both the recreation and entertainment industries. Not only is it affordable and requires little knowledge of chopping wood, it’s also an activity for multiple age ranges, from your best friend’s 10-year- old son to your 70-year- old aunt. If you can hold a cup, you can throw an axe. All it takes is a positive attitude and a willingness to learn—wearing plaid also helps immensely. 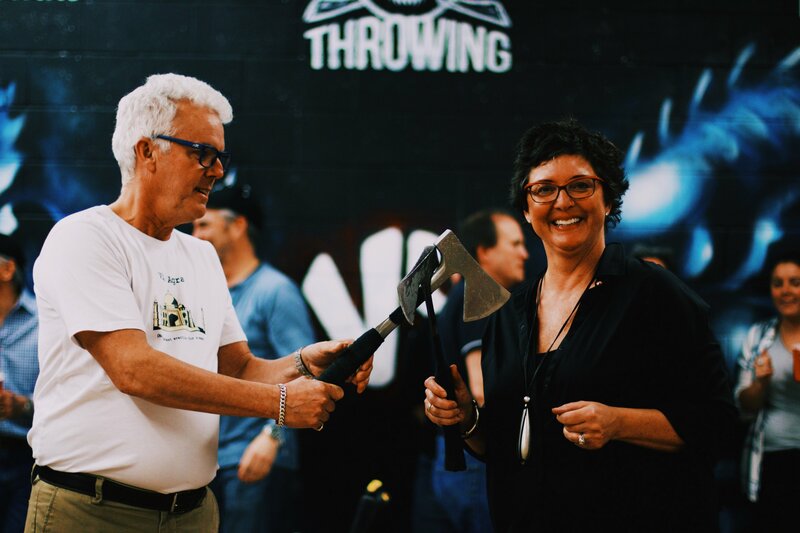 With locations across Canada, Bad Axe Throwing offers the perfect informal yet cozy environment to discover your favourite new talent. Expert instructors guide you every step of the way on perfecting your technique while staying completely safe. While sharp enough to stick to a wooden target, the blades of the axes aren’t razor sharp to the touch. You’ll have a coach watch your every move to ensure you’re only picking them up by the handle. Each one weighs a little over a pound so you can focus on hitting that bullseye. Similar to bowling, each target area is marked off by lanes with fences to keep you, your party and other axe throwers safe. Coaches keep score and crown a champion at the end of the round-robin session. There’s even a league for those who want to get more serious and compete on a regular basis. Unlike other sports, there’s no need for fancy shoes, hats or performance-enhancing gear. All you need to wear is something comfortable. (Again, plaid is recommended). Any sport should be fun and bring people together—whether to play or cheer. Even if those in your group may not want to chuck a steel blade, they can still enjoy watching others take their shot at the bullseye (with no extra charge!). Be an inclusive host and secure your reputation as an epic party planner. Ready to add more edge to your next night out? Book your axe throwing event near you for an unforgettable experience! Walk-in Axe Throwing is Here!